• 6 Feb 2008 - The Straits Times reported that a former employee of the STC who duped horse owners and levied phony import fees on owners for years was jailed for five months on 5 Feb 2008. The Singapor Turf Club charges about S$1,425 (excluding goods and services tax) for the import of horses and forbade any cash payments to its employees. 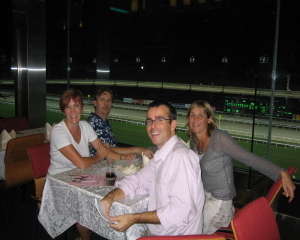 All fees paid to the Club are to be handled by the Singapore Turf Club Finance Department. • 31 Jan 2008 - It is most unfortunate that just when things were running smooth and well, that Equine Sanctuary has to cease its spelling operations at Horsecity due to unforeseen circumstances. 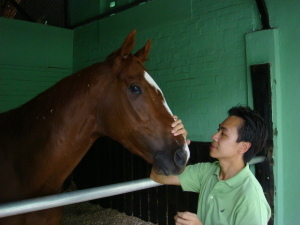 It was a horse spelling facility in Singapore, set up by Mr Eric Koh, an ex-Stipendiary Steward with the Singaore Turf Club for 5 years, and was built in mind to create the optimal environment to allow gradual healing (through rest) of thoroughbred horses while keeping them in close proximity to their trainers and owners in Singapore. Equine Sanctuary is presently in talks to obtain suitable land to continue its spelling operations. Meanwhile, their quarantine and stable management services remain in full operation and their quest to provide quality services and one-stop solution for the equine industry remains a top priority. Eric Koh at the spelling station. • 20 Jan 2008 - TOAST President, Treasurer and two other members attended the RDA @ The Races, a fund-raising event organized by the Riding for the Disabled Association Singapore (RDA) which raised an amount of $100,000 for charity. 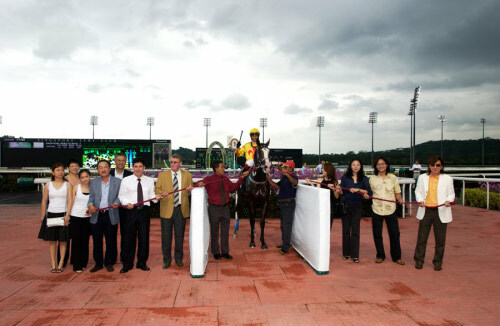 "Lim’s Fighter", ridden by Jockey Din Aziz, won the S$125,000 RDA Cup Open, 1400m on turf track. "Lim's Fighter" paid S$12 for a win and S$5 for a place. • 19 Jan 2008 - "Oneninetyfive", winner of the Singapore Turf Club's 3-year-old Sprint Cup 2008, and is owned by “Key to Success” Stable comprising of TOAST members Ms Esther Ko, Mr Calvin Koh, trainer Mr Brian Dean and two others. “Oneninetyfive” was bought as a yearling at the Adelaide Magic Millions Yearling sale in 2006. Since coming to Singapore, “Oneninetyfive” has proven to be something “special”. So far after 6 starts he had 4 wins and 2 seconds including a hattrick and the Group 3 3-year-old sprint. The owners feel very fortunate to have such an exciting horse in their first venture together. 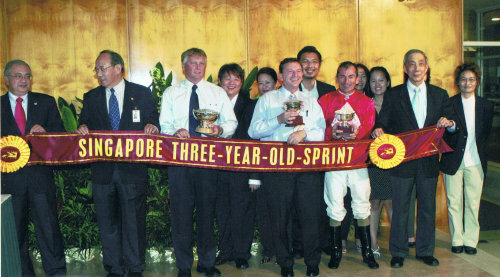 Owners, trainer and jockey accepting their prizes after "Oneninetyfive" won the 2008 Singapore Three-Year-Old-Sprint. • 7 Jan 2008 - We were honoured and pleased that Seoul Racehorse Owners Associaton (SROA), represented by its President, Mr Sung-Hyun Nam, and his son, Mr Y S Nam, met up with TOAST President and Treasurer for lunch. During the lunch meeting, Mr Sung-Hyun Nam briefed TOAST on their organizational set-up. SROA has a membership of 484 and 1,600 horses at present. Their membership target is 500. There are 700 owners and 1,000 horses in Singapore. All horse owners in Korea must be members of SROA. Their membership is by invitation only and applicants are assessed based on their financial credibility and status by a panel of Committee members from the Korea Racing Association (KRA) and SROA. Horse racing history in Korea can be traced back to May 1898. KRA, under the supervision of the Ministry of Agriculture and Forestry, conducts horse racing with thoroughbreds and native Jeju pony racing in Seoul Racecourse and Jeju Racecourse respectively. 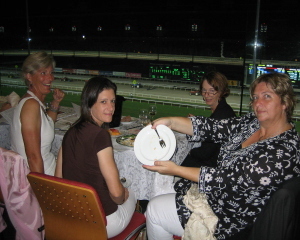 The third racecourse, Busan Racecourse, for thoroughbreds was opened in Apr 2005. The annual turnover for Korean racing is USD 6 billion as compared to Singapore’s S$2 billion. In Korea, there are presently 56 horse trainers and about 70 local jockeys including 3 Japanese jockeys and 2 to 3 Australian jockeys. After the lunch, TOAST brought them to visit Mr Soong Tze Ming (Senior Vice President, Racing at the Singapore Turf Club) for a courtesy call, followed by a tour around the Singapore Turf Club premises and a visit to trainer Dr Yeoh Kheng Chye’s stables. • 23 Dec 2007 - “Prima Commands”, formerly owned by TOAST Trust No. 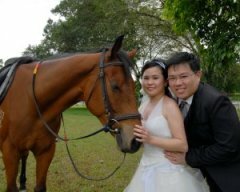 6 and now stabled at the Bukit Timah Saddle Club (BTSC), was loaned out to Mr Bernard Chow and Ms Sze Chee Neu, who are both passionate about horses, for their wedding photo taking at BTSC. 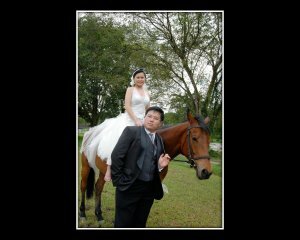 Wedding photos of Mr Bernard Chow and Ms Sze Chee Neu taken with "Prima Commands" at BTSC. • 16 Dec 2007 - TOAST congratulates our TOAST member, Mr Mave Yeo and Champagne Stable, who owned “Big Maverick”, the “outsider” horse that won the S$200,000 Stewards’ Cup Group 3 (3YO) 1400m on turf track. 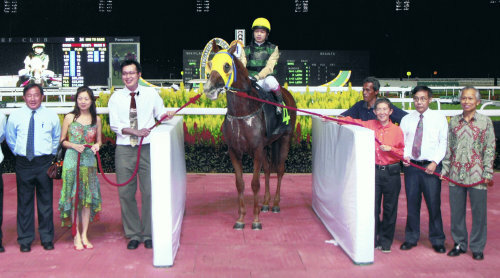 Ridden by Sam Subian, "Big Maverick" beat 13 other horses to pay a dividend S$231 for a win and S$58 for a place. Mr Mave Yeo with connections of Champagne Stable leading in the 2007 Stewards' Cup winner, "Big Maverick". • 10 Nov 2007 - We are pleased that another photographer, Mr Yeo Wee Han, whose images have been published regularly in the Straits Times, Winning Post and the Singapore Turf Club (STC)’s official website, has been authorized by the STC to sell racing winning photos to owners, trainers and jockeys. He can be contacted at yeoweehan@gmail.com or website: www.tripeaksimagery.com and h/p: +65 9795 7296 if you do need his services. 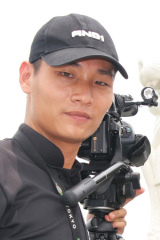 Mr Yeo Wee Han, a regular professional photographer at the Singapore races. 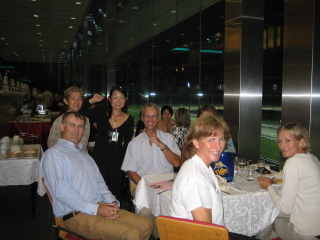 • 2 Nov 2007 - Our Committee Member, Ms Yuki Otani, assisted Bukit Timah Saddle Club (BTSC) to organize for 33 BTSC members and their friends to a night of thrill and excitement at the Singapore Kranji races. They had great fun and enjoyed watching the night racing. Hopefully, it will attract their interest in having a stake in owning a racehorse in the near future. • 13 Aug 2007 - TOAST Trust No.8 has been terminated. The horse, “Silver Purple” was put down on veterinary grounds. • 27 Jun 2007 - TOAST Trust No.10 horse, “Xenolith Gold”, has a knee operation. It would be out of action for about 6 months of rehabilitation. • 25 May 2007 - TOAST Trust No. 9 horse, “Kamsky”, when ridden by Jockey App H K Lim, beat 7 other horses in a Kranji Stakes C, 1600m on turf track. "Kamsky" paid S$74 for a win and S$15 for a place. TOAST Trust No. 9 stakeholders, TOAST Committee and trainer Dr Yeoh Kheng Chye leading in "Kamsky" after winning the Kranji Stakes C.
• 30 Apr 2007 - TOAST thanks Mrs Lily Ho for the preparation of the TOAST Statement of Accounts for year of assessment 2006-2007 and members Ms Esther Ko and Mr Lim Swee Ann, who volunteered to audit the TOAST Statement of Accounts for year of assessment 2006-2007. • 1 Apr 2007 - TOAST member, Mr Bernard Lee’s horse, “Forbidden City”, was involved in an unfortunate fatal accident at the race and was subsequently put down. TOAST had provided a supporting letter via e-mail to the Singapore Turf Club for Mr Bernard Lee to be indemnified for his loss of “Forbidden City” and is pleased to see it being successfully resolved. TOAST is also pleased to see that Singapore Turf Club is now using a white tape instead of the previously used black tape after this incident, as horses are colour-blind and it is even worse when they get panicky. • 5 Mar 2007 - TOAST Trust No. 7 has been terminated. The horse, “Bolnisi Gold”, has been put down due to slab fracture in his right knee joint. Despite its short life span, its race performance, including 3 wins out of 9 races, gave stakeholders much fun and enjoyment. “Bolnisi Gold” was a gutsy horse, always tried its best and gave a hard run. Jockey Calder commented it could not walk on returning to the stable after its last race.